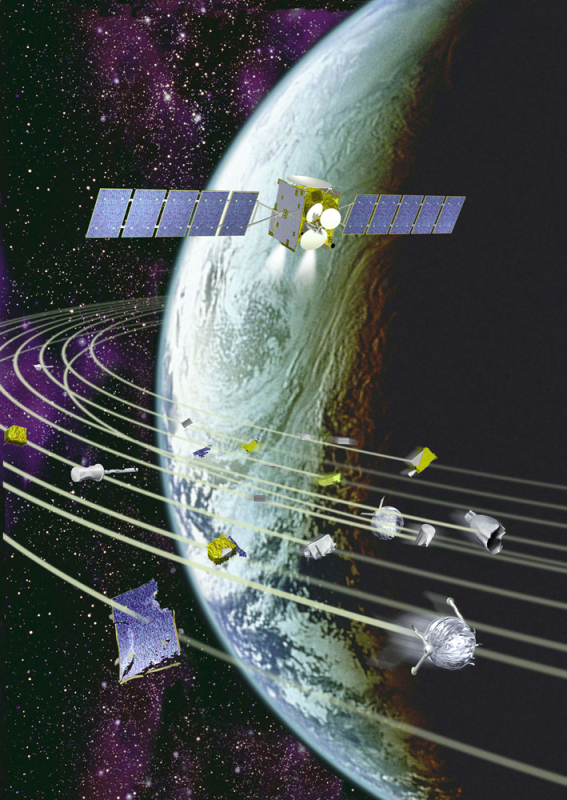 The sheer numbers of space debris objects now in Earth orbit are obliging space agencies to adopt measures to sustain the long-term utilization of space. CNES is working to tackle this issue on the United Nations COPUOS committee. A picture of the cloud of space debris in low-Earth orbit. Credits: NASA. The space beyond Earth’s atmosphere is currently populated by 16,000 objects larger than 10 cm across, 300,000 between 1 and 10 cm and more than 350 million smaller than 1 cm. These man-made objects—spent satellites, launcher stages, fragments and so on—accumulated since the start of the space era in 1957 and the launch of the Soviet Sputnik satellite today pose a threat to the safe utilization of so-called “useful” orbits in the years ahead. “If we do nothing, will space still be useable in 100 years’ time?” asks Mario Hucteau at CNES’s Department of International Affairs. Artist’s view of a satellite and a sample of space debris orbiting Earth. Credits: CNES/D. Ducros. This burgeoning population of multiform objects is the root of many problems, chief among them the risk of collisions or explosions generating fresh debris, damage to operating satellites and the need to conduct collision-avoidance manoeuvres from the ground. Within the 70-member COPUOS1, where France is represented by CNES, the issue of space debris and more broadly of the long-term viability of space operations is now a top priority. Useful orbits are protected by transferring defunct satellites to graveyard orbits or de-orbiting them for a controlled atmospheric re-entry. Credits: ESA/CNES Activité Optique Vidéo du CSG/Latitude 5/S. Quartararo. Faced with the exponential growth of orbital debris, new rules concerning launches and end-of-life disposal of satellites have been adopted. 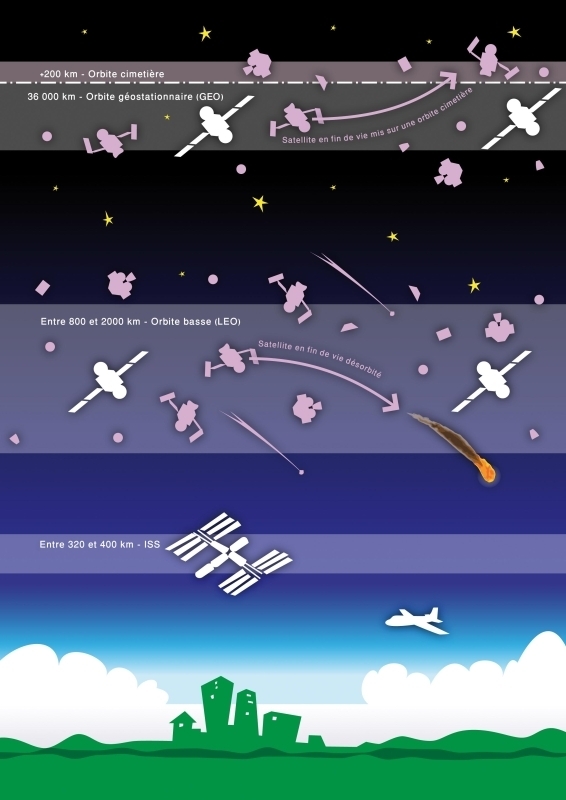 These rules complement one another, either seeking to limit or even halt deliberate pollution of space altogether, or protecting certain zones (by passivating launcher stages and satellites, moving them to graveyard orbits and de-orbiting them for a controlled atmospheric re-entry within 25 years). Projects to clean up space are not lacking. Avenues currently under investigation include ionic thrusters, de-orbiting kits, solar sails, nets and more. How precisely can a satellite’s position be indicated without compromising national security? Who cleans up and what can or cannot be cleaned up? Who pays? 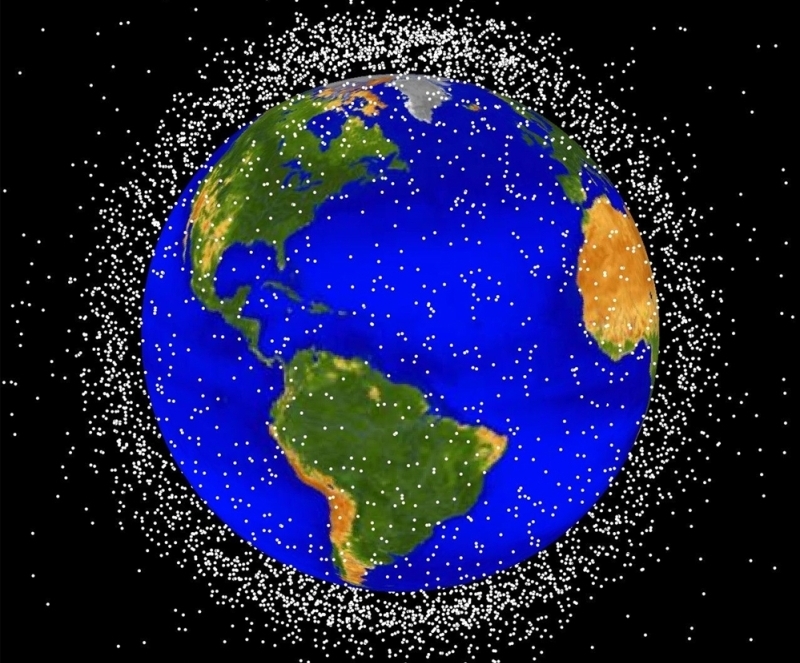 Should a space debris tax be levied? Paradoxically, space is not as vast as it seems and the pathways up there are far from limitless. Geostationary orbit is a unique, fragile and precious resource. What now seems certain is that debris mitigation will need to be factored into the design of future satellites and launch systems from the outset, to ensure sustainable development of space.